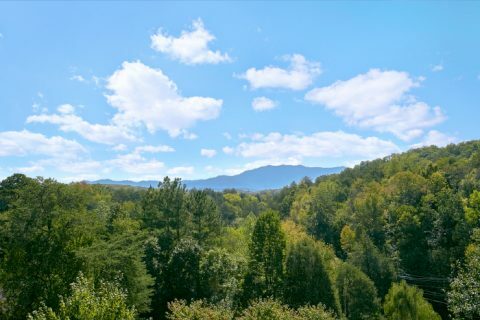 Experience the beauty of a Pigeon Forge resort area with the convenience of staying only minutes away from downtown! "A Little Bit of Heaven" is a perfect luxury cabin for the vacationer who wants convenience and comfort on their Smoky Mountain vacation. 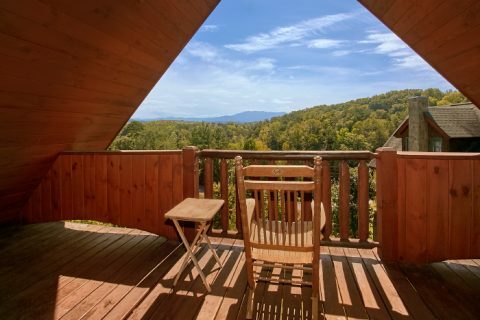 Nestled in Lantern Hill Resort, this 2 bedroom cabin enjoys a spot in a lovely cabin community with views of the Smoky Mountains in the distance. 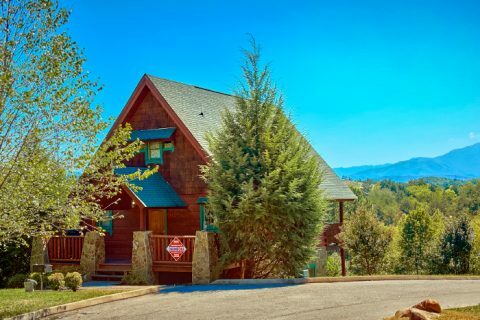 From this convenient area tucked away in the mountains near Pigeon Forge, guests will have their pick of fun attractions, excellent shopping outlets, and delicious restaurants to try on their trip! 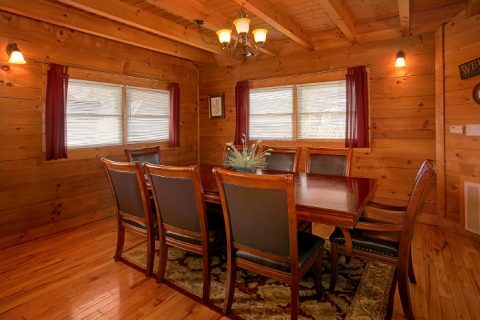 When your family isn't busy enjoying thrill rides at Dollywood or exploring fun activities on the Pigeon Forge Parkway, they'll love unwinding at this comfortable cabin that's only minutes away from the action. 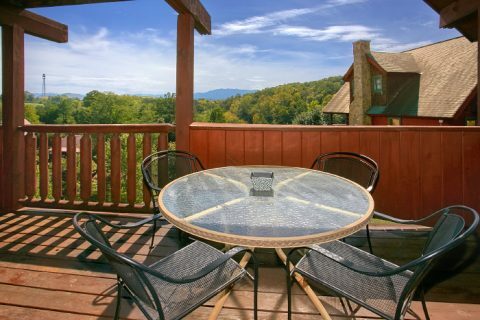 This resort features country roads and flat driveways that make these rentals accessible. 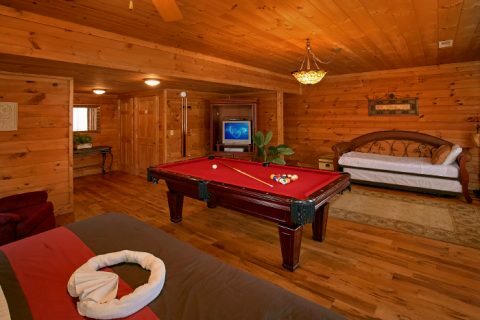 With great amenities like a jacuzzi tub, pool table, gas fireplace, and WiFi Internet access, you'll feel right at home in this luxury cabin in Pigeon Forge, TN! 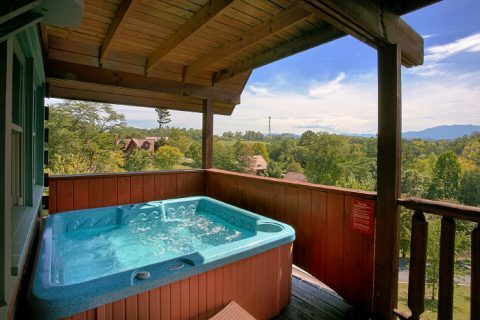 Step out onto your cabin's deck to enjoy the mountain air and take a dip in the bubbling waters of your rental's hot tub. 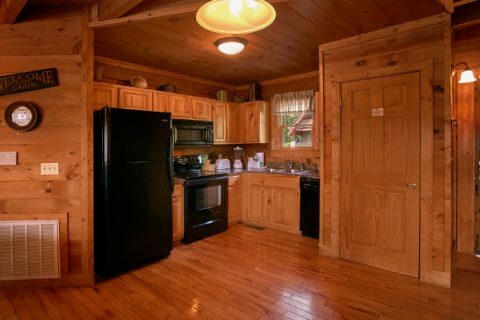 For dinner, there are dozens of excellent restaurants only a quick trip away, but your cabin also offers a full kitchen and a BBQ grill. Making delicious dinners on vacation just the way you like is a cost-effective way to save on your vacation and spend quality time with your family. 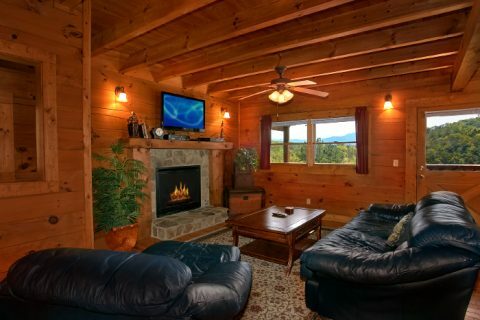 After dinner, enjoy a relaxing stroll in your cabin's resort area or watch a movie in the living area complete with a stone gas fireplace. 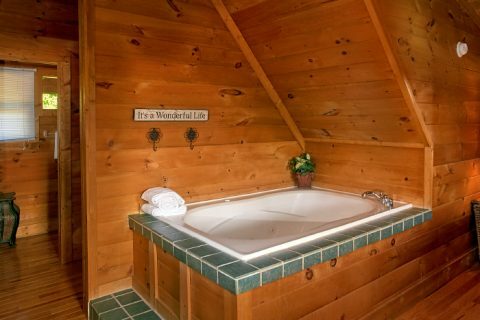 For some romantic time alone, take a dip in the waters of your cabin's jacuzzi tub while the kids enjoy some friendly competition on the pool table. 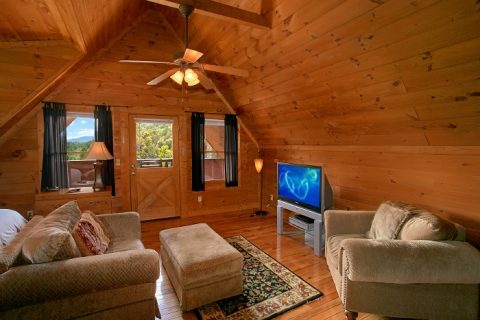 Once it's time to get some rest, you can look forward to retiring to one of this cabin's two bedrooms. 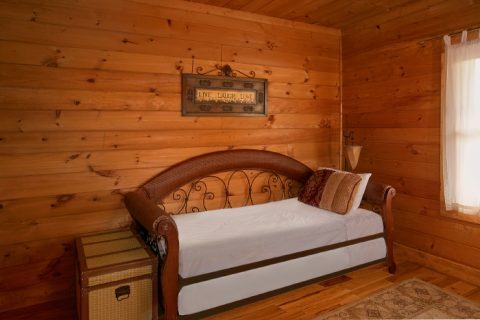 The upstairs suite boasts a king bed, jacuzzi tub, 42" television, private bath, and access to a private balcony. 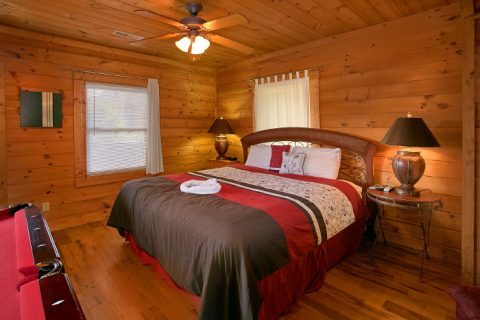 The master bedroom offers another king bed, television, a private bath, and access to the deck. Additionally this room features a twin-size trundle bed for another guest. 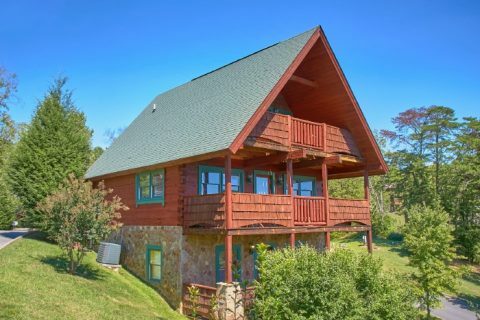 Altogether, this luxury cabin in Lantern Hill Resort comfortably sleeps 8 guests, but we offer several other cabins in this resort area that can be booked at the same time to fit larger groups. Please call our number and a reservations specialist will be happy to assist you! 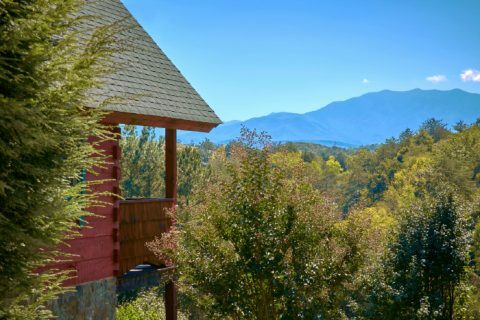 Book your luxury cabin in Pigeon Forge with mountain views today to save big on your cabin vacation in the Great Smoky Mountains of Tennessee! 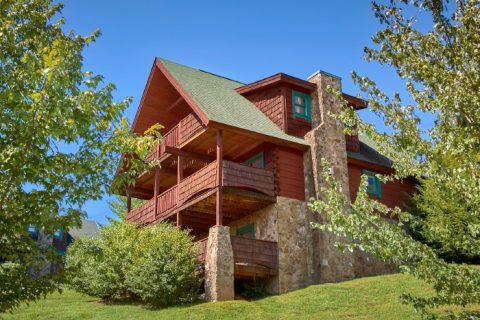 Earn a 15% discount on your stay by calling our office or reserving this rental online today!